Horror fans be advised, this isn’t a scary movie. It is a dramedy with a monster element, if any horror fans out there must see everything monster related. In Colossal we follow an out of work, borderline alcoholic girl named, Gloria (Anne Hathaway). After her English boyfriend in New York City breaks up with her, she’s left with no place to go. Forced to move back to her small hometown in Maine. Gloria quickly takes up with a childhood friend Oscar (Jason Sudeikis) and his group of barfly friends, in her attempt to adjust to small town sobriety. Meanwhile on the other side of the planet, Seoul, South Korea is being visited/attacked by a Colossal monster. Gloria unravelling her connection to the Colossal South Korean monster, plays an underlying story to the character study that’s the basis of the film. 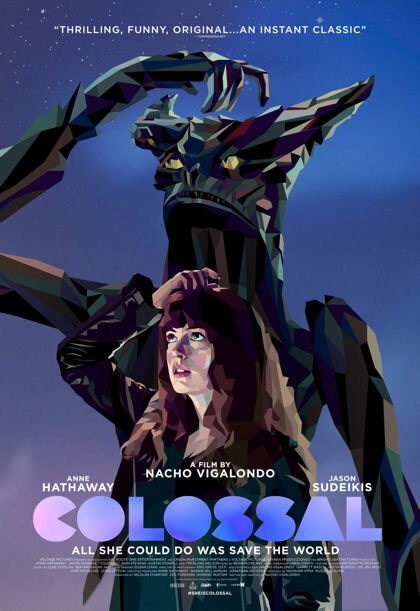 I got excited to watch Colossal when I saw that it was directed by Nacho Vigalondo in his first feature since Open Windows. Colossal has much less of a horror theme than his previous 2014 thriller. Avoiding spoilers as much as possible, a plot of a magical event leads to the creation of two monsters appearing sporadically in South Korea. Even going with the lighting rod brainchild of a story, the film is still character based. Vigalondo provides us with a cast of intentionally flawed people surrounding the seemingly perfect, good character. Casting an actor people automatically view as a likable person played into the filmmakers plot. As the characters personalities come out more the battle of real monsters begins. Unfortunately the motivation behind the good vs evil plot the film dwindles into, comes up short in logic. The story explains a characters evil intentions as feeling small in life. Hiding who you are from the world is something many people do. I could believe someone’s sexual frustrations or the madness of love more than wanting to control another person because you feel your life is unimportant. Even if that was the case, wouldn’t being in control of a gigantic monster and the city it could destroy, overshadow the control you have over a single person? I know Anne Hathaway is known for her thick hair. I don’t know if her hair in this film was a wig or natural but it looks annoyingly, unrealistically, like a wig. It could just be the horrible bangs. If you make scratching your head a vital point of your film, you can’t have the simplicity of hair be that annoying. Yes, I said scratching your head is a vital point in this film. I did enjoy the performances of the always great Tim Blake Nelson and though I’ve never noticed him before, Austin Stowell played clueless well as Joel. The monsters themselves looked surprisingly good and not just for an indie film. It wasn’t the ridiculous plot, considered quirky only because it’s an indie film, that kept this movie from being enjoyed more. I’ll generally give any film premise a chance. It’s the lack of likability in a film that relies on character left me generally uninterested.